Community nurses need to be involved in developing health plans for homeless people in their locality, a new survey has revealed. The Queen’s Nursing Institute (QNI) believes the findings of its – as yet unpublished – survey of the 1,500 members of the organisation's Homeless Health Programme demonstrate community nurses should be given a major role in delivering the recently announced government strategy to end rough sleeping by 2027. 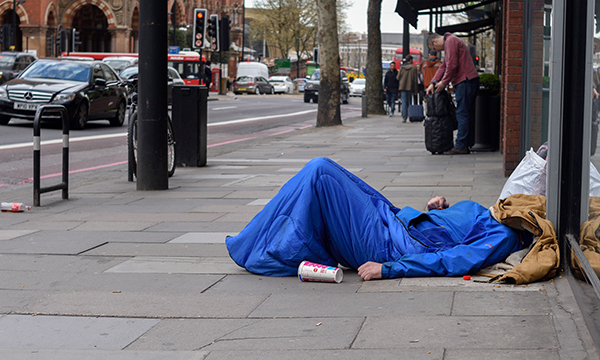 The charity says service commissioners should involve nurses with knowledge and experience of providing care to homeless people when drawing up the local health plans recommended in the strategy – because these nurses play ‘an essential role’ in delivering care. The full survey results will be published in October and also include calls for improvements in service capacity and quality, healthcare access and education of NHS staff. The QNI’s Homeless Health Programme manager David Parker-Radford said: ‘Well-resourced and coordinated community-based health services, including mental health and substance misuse, are necessary to prevent people’s health deteriorating to the point of needing emergency hospital admission. ‘Our nurses also identified that better collaboration between professionals locally could help prevent people falling through gaps. A major area identified in the government strategy is a pledge to do more to help people with mental health and drug addiction problems who are sleeping rough. Mr Parker-Radford particularly welcomes the strategy’s promising of training for front-line staff on how to help people under the influence of the artificial cannabinoid Spice. He added: ‘Nurses have constantly raised with us the dangers of Spice and its increasing use in the homeless population. The drugs are cheap to acquire, highly addictive and require specialist urine testing to detect.